Muscat, Oman, 18 October 2017—Oman’s pioneer and biggest exhibitions and conferences organizer Omanexpo is slated to hold the second edition of its Oman Waste Environmental Services Exhibition and Conferences from December 13 to 14 at the Sheraton Oman Hotel. 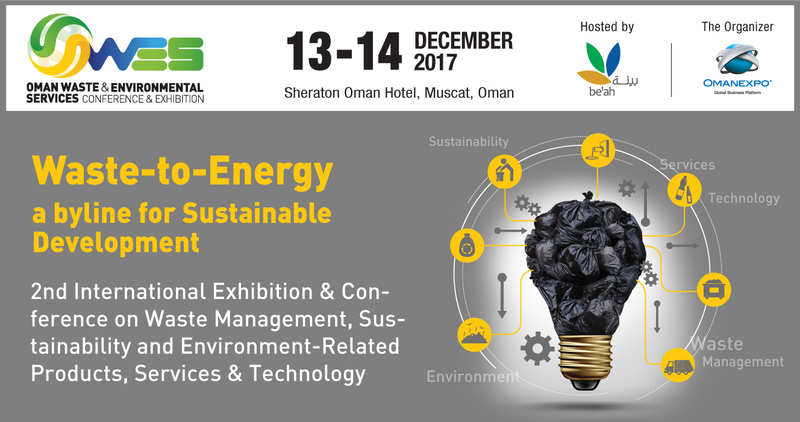 Organized in partnership with state-owned waste management body Oman Environmental Services Holding Company (be’ah), OWES is the only waste management and environmental event in Oman. It was designed against the backdrop of a growing need to reduce waste in landfill sites by converting it to energy and of the bigger aim to move towards a circular economy. Leveraging the need to address these challenges, the conference will center on recycling, waste classification, facility management, advanced and innovative technologies for waste collection, transportation, sorting and recycling, and the future of waste management in Oman. Interactive panel sessions will focus on best industry practices in recycling and reusing, trends that are helping reshape the waste management industry, and technologies, investment and market. Highlighting the second session of the first day is a case study from Europe about the international trends in MSW-to-energy conversion, which will be presented by Dulce Passaro, ex-minister of Environmental Affairs of Portugal. This year, the accompanying exhibition will once again provide a beneficial trade platform for companies representing various segments such as solid waste, waste management,energy, waste-to-energy, waste recycling, urban environmental cleaning, environmental monitoring, consultancy, landfill operations, and more, to showcase their products and services to an exclusive audience. The 2016 edition welcomed 54 representative companies from nine countries. Be-ah is embarking on a waste management plan, which will require investments totalling to about USD 1.1 billion, USD 150 million of which will be for MSW infrastructure; USD 750 million for a waste-energy-water project; and USD 150 million for industrial waste infrastructure. There are about 350 dumping sites across the country which will be closed and replaced by high-tech controlled eco-friendly engineered landfill sites that will dispose the waste with high-quality environmental standards. The project is estimated to cost USD 161 million.